Yippee! The weekend of the Tucson Festival of Books has arrived. We’ve been eagerly anticipating this since we first heard about it back in January. Over 400 authors with readings, book discussions, and book signings coupled with 350 related vendors and displays. There was a Science City area with displays, activities (mainly geared toward kids) and projects which was the most fun area of all. If you click on the first photo, you can enlarge the gallery…. John and I had poured over the schedule, marking the activities and speakers we wanted to be sure to catch. It was impossible to really get everything done in one day. We headed to the Festival early, arriving around 9am. After spending a bit of time scoping out the area, located in the beautiful mall area of the University of Arizona, we headed over to the Mirror Lab of the University, where we had booked a tour. This lab is one of the few places in the world where the large telescope mirrors are made. Several unique process were pioneered here. The largest of these honeycombed mirrors are 8.2 meters in diamater (that’s as big as they can make them, and still get them on trucks and boats to get them to the telescopes). The current project involves manufacturing mirrors for the Magellan Telescope in Chile. It’s amazing to see, and we felt very privileged to have been able to tour this remarkable facility. After our tour, we split up so as to both spend the day seeing the individual authors and areas we each were most interested in. I made a beeline for the culinary area, where they had a huge tent and cooking stage set up for various cookbook authors. Making sausage was Bruce Aidells, author of The Great Meat Cookbook. Although it was hard to see what he was making, his running chatter and banter made it all worthwhile. After completing sausage, he finished with two beef dishes. The audience members he had selected to be his tasters were all smiles. LED lights on the bottom are the easiest to light. The top incandescent bulbs on the top require the most energy. I got three of the four on the top lit. Had a hard time keeping my feet on the pedals! You definitely want CFL and LED bulbs in your home where you can utilize them. hyrdoponic gardens, snakes, desert animals, falcons, bugs, and so many fun things. The temptation to spend the entire day in that one section was very strong, even though I’m not much of a science nut. Back into the main thoroughfare, I had my best encounter of the day when I wandered into Chuck Klosterman’s presentation. Although I’ve not read any of his books, I’m a big fan of The Ethicist column he writes for the NY Times. He’s an old-time rock ‘n roll critic, and a pop culture hero. Chuck was funny, smart, sassy, and hugely entertaining. His books are now all on my short list to read. There were dozens of small publishers represented there and authors hawking their own books. So much to read…so little time. A grabbed a bit of lunch, and headed back to the culinary tent to catch part of a demonstration of Indian cooking by author Meera Dhalwala. 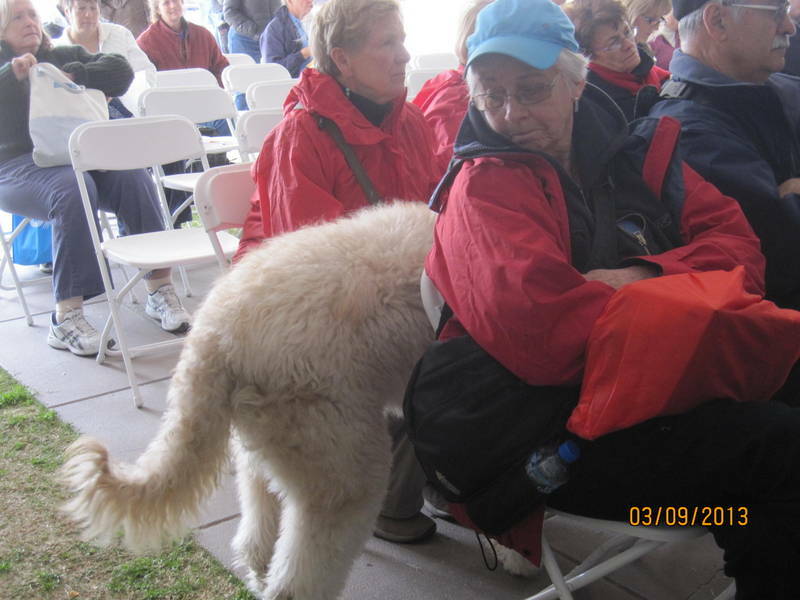 Had to cut out early to get to my volunteer shift at one of the booksigning tents. I was so fortunate to land an assignment in the area where Tim Egan and Douglas Brinkley were signing. 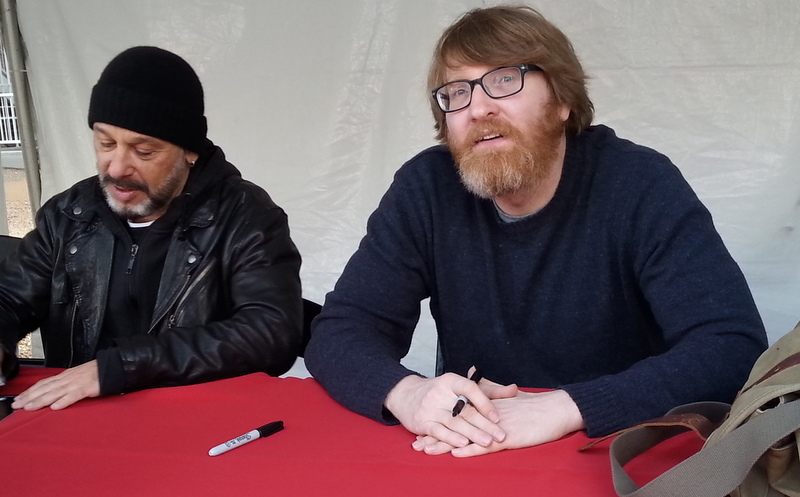 In the last round of booksignings at my area was Chuck Klosterman!! Yea! Still charming and witty. I’m a big new fan. Also, Susan Vreeland and B. A. Shapiro were there, after their seminar on Secrets of the Art World. Avid fans lined up with books there as well. A mixologist Tony Abou-Ganim was there, signing copies of his bartending book, and his book about vodka. And last, but not least, Rajiv Chandrasekaran, National Editor of the Washington Post. His two books (Imperial Life in the Emerald City, and Little America) are both on the subject of Afghanistan. Such a great day. My feet were aching after pounding the concrete for 9 hours, and I was cold and damp. It rained on & off all day, and the wind made everything uncomfortable. The upside to bad weather was a smaller crowd. Can’t wait for next year. 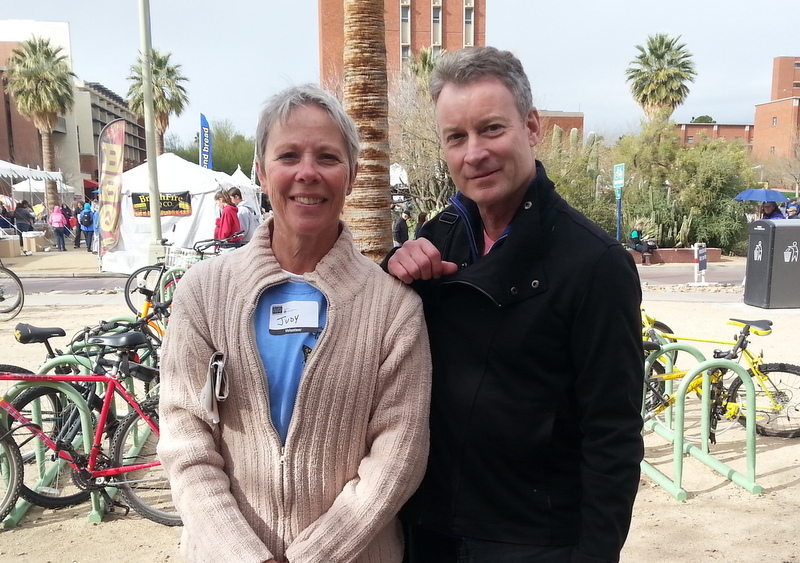 Here are a few more images from the Tucson Festival of Books. crowd-pleaser crossword puzzles were scattered all over the area. what’s any kind of festival without a few religious zealots? 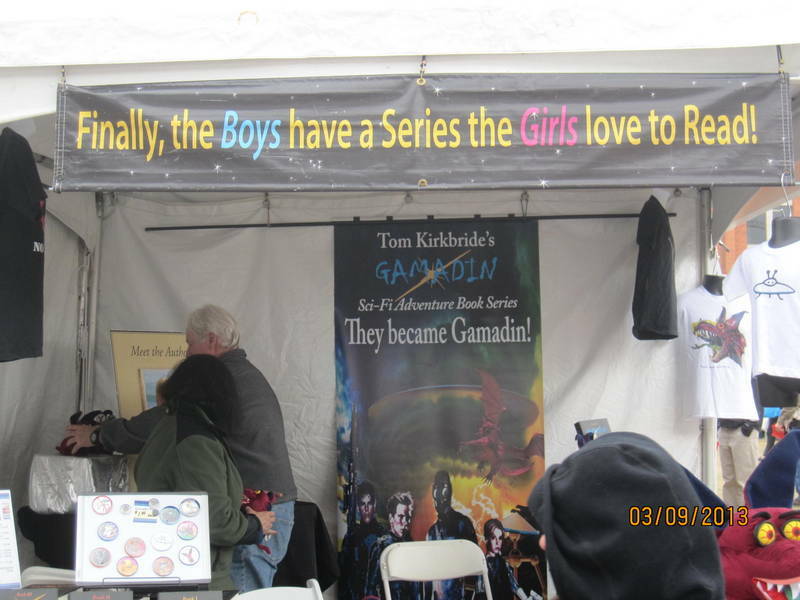 This entry was posted in Arizona, books, Tucson Festival of Books and tagged Arizona, books, Tucson, Tucson Festival of Books by Judy Crankshaw. Bookmark the permalink. Reblogged this on Through Artificial Eyes. This is awesome. I’m happy that you still get a little shot here and there of the book life. Chuck is a favorite sports narrator for me. I know he’s better known for other stuff but his work with the NFL network as well as his writing on Grantland.com is great. He really does a good job capturing the feel of what its like growing up idolizing sports figures. Its sappy and cliche but I like listening to him so that I can remember thoughts I had watching Michael Jordan or Barry Sanders. Also, Tim Egan?! what you described for his discussion sounds like a fascinating hour of radio on NPR. I love his books! This Festival was fabulous. I didn’t get to hear Egan speak – missed both of his sessions – one on Shadow Catcher, and one on Teddy Roosevelt & National Parks. He was very personable and warm. His NYT column is one of my favorites. Thanks for reposting the blog. Next year, you should plan on coming out for this event – we’ll put you up for a few days! I’ll be checking in with you to see which of Chuck’s books you have for me to borrow. Have already gone back and read some of the Grantland.com things. Listening to him in person was fabulous – he’s so natural and expressive. And, I’ll be buying his new book in July, for sure. (score me an ARC, will you?) Miss all of you guys. Say hi to everyone for me.